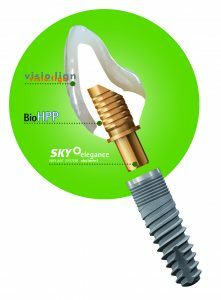 SKY elegance is an individual tooth solution, with abutments that can easily be adjusted in the mouth. SKY elegance abutments are usually placed at the time of implant placement surgery, allowing the tissue to heal around them, and form a tight seal during the healing phase. On completion of healing, the abutment can be treated as a natural tooth. It can be easily prepared to accommodate various types of restorative materials including composites and ceramics; and what’s more the compressive properties of the material provide ‘give’ in the material ensuring that opposing dentition is protected and chipping is minimised. The SKY elegance treatment has been developed in cooperation with experienced implantologists, prosthetic specialists and dental technicians to provide an innovative one time therapy. What are the benefits of BioHPP® SKY elegance? 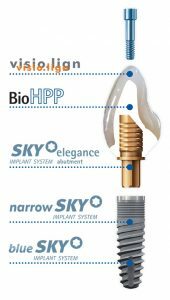 The SKY elegance abutments are a new type of abutment with a titanium core and a sleeve made of the ceramic-reinforced high-performance polymer BioHPP®. The abutment is placed at the time of surgery and never removed. A temporary restoration can be fitted at the time of initial surgery and when the time of the final restoration arrives, the abutment can be adjusted easily in the mouth. This would be followed by a conventional impression and restoration which can be made using any restorative materials including all ceramic, composite and metal ceramic. During the initial healing phase, tissue attachment is achieved with the BioHPP® material leading to the prevention of bacterial infiltration around the implant-abutment junction. As the abutment is never removed, this tissue ‘cuff’ providing a seal around the abutment is never broken, ensuring longevity of the implant and minimising risk of peri-implantitis. As individual abutment, which is fabricated on the SKY elegance titanium base using the for2press system and the traditional modelling technique. As a prefabricated abutment in the designs/shapes of the SKY aesthetic line. The key with both types of abutments is the ‘no gap’ between the titanium base and the BioHPP® abutment material. The pressing process eliminates the need for cement to hold the two parts together, making this great news for the healing process as cement can impede this. Additionally, SKY elegance abutments can be easily adjusted and re-adjusted in the mouth, using tungsten carbide drills. The abutments can also form the basis for a large span bridge, as they can be trimmed, like a natural tooth, for the desired path of insertion.